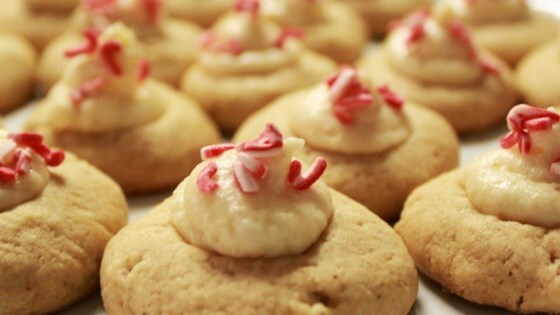 "Thumbprint cookies with a delicious filling, these are perfect for Christmas. Does not use eggnog, but they have an eggnog taste. You can substitute 1/4 teaspoon rum extract and 1 tablespoon milk for the rum." In a medium bowl, cream together 3/4 cup butter, white sugar, and brown sugar until smooth. Beat in egg and vanilla. Combine flour and salt; stir into the creamed mixture by hand to form a soft dough. Roll dough into 1 inch balls, and place balls 2 inches apart on ungreased cookie sheets. Make an indention in the center of each cookie using your finger or thumb. Bake for 12 minutes in preheated oven. Cool completely. In a small bowl, mix together 1/4 cup butter, confectioners' sugar, and rum. Spoon rounded teaspoonfuls of filling onto cookies. Sprinkle with nutmeg. Let stand until set before storing in an airtight container.